I see you now, but mostly in photographs. I keep the ones that look best. These are the pictures of better times and they were taken in better places. They are the pictures that remind me of when you were young. The other day, I told the story about the time I met your first date after Pop died. Neither you nor I were ready for this. Then again, neither you nor I was ready for The Old Man to pass away. But time had also passed and you agreed to a blind date. The man you picked, or more accurately, the man that was picked for you was not a perfect match by any means. He wore his hair in a comb-over. He wore glasses and dressed in a very plain, unflattering style. He had no spark or charisma. Perhaps I never mentioned this, but to me, the man looked like a school teacher. And actually, he looked exactly like a substitute school teacher that I once hazed named, Mr. Rowley. I suppose this was enough to make me hate your blind date. But more, this man was in my father’s home and sitting in my father’s kitchen. The Old Man would have wanted you to be happy. I wanted you to be happy as well—just not with Mr. School Teacher. If you remember, I woke up late after a long night out with the boys. I believe it was 3:00 in the afternoon. I walked downstairs and into the kitchen. There he was . . . He spoke as if he were trying to sell me something. I suppose this man was as uncomfortable as I was. But he was nowhere near as hateful. “Are you just waking up from a nap?” asked the man. He was sitting on one of the two stools at the counter between the kitchen and dining room, which was across from the sink, stove, and the cabinets above them. Not only was he sitting at the counter, he was sitting at the counter, which was built and tiled by The Old Man. I turned my back to him as he tried his best to speak with me. “So?” he responded with a slight laugh. Nervously, he continued, “Who has breakfast at 3:00 in the afternoon? I suppose he knew then. I suppose he felt the figurative drain plug to his soon to be date was opening and he was cycling down, soon to be removed like an excess of useless wastewater, which was about to flush into the sewer. I was wearing a pair of plaid lounge pants, which at the time, was made by a popular brand name known as Skidz. I was not wearing a shirt. My hair was disheveled. My voice was anything but kind and my responses to the man’s questions were anything but welcoming. I opened the cabinets above the sink and above the counter to retrieve a loaf of bread, a jar of peanut butter, and a plate to put them on. I turned towards the refrigerator without making eye contact with the man, who I would have rather seen leave quickly, if not painfully, instead of sitting in the kitchen. “What are you making?” the man asked. “What kind of breakfast is that?” he asked. This is when I turned to face him. I responded with every ounce of hatred and contempt. Appearing to shrink and shrivel, this seemingly weak man leapt up from the chair. He stood, but he stood much shorter than me. He was slightly round near the stomach area. The man’s thick, black rimmed eyeglasses appeared crooked from his swift jump from the stool. I suppose this is when he understood how unwelcomed he truly was. He was afraid and trying to adjust himself. It was obvious to me. This man had no business in my father’s home. He had no backbone. No spine at all. He was the embodiment or focal point of my anger. My Old Man was gone, and as sure as I lived, I selfishly refused to allow this spineless human being another moment of mine or my mother’s time. But all the while, Mom, you were standing on the steps and coming downstairs. You were heading from the bedroom, which you shared with your late husband. You were walking through the home, which you decorated with the love of your life. You were standing on the steps, listening to your youngest son, and heartbroken because you knew I did not approve of this man. And rather than allow yourself a moment, you sacrificed an opportunity. I never knew you were there until you told me so. Needless to say, your date did not go well. As the story goes, you left the house with this man, and shortly after, you asked if he could turn the car around and bring you back home. You never brought a date to the house again. Motherhood is a strange unending job. It comes before everyone and everything else. We always ate first and you ate last. The home was cared for—even after your long days, your chores were never finished. I remember the times when I was in the hospital. I remember the stuffed animal, which I still have. His name is Tuffy. 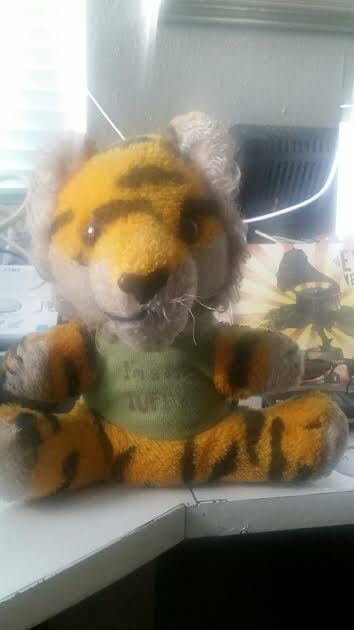 Tuffy is a small tiger in a little green shirt with the words, “I’m a little Tuffy” printed on the front. You gave him to me when I was eight. This is when I was in the hospital for gastroenteritis. I was there for more than two weeks. I could not keep any food down and the pain from the I.V. needles left my arms swollen and almost purple. When the doctors took me in for testing, I returned to the room, and there he was. Tuffy was sitting on my bed at the bottom of the pillow. The nurses lifted me and placed me on the mattress. I held that little stuffed animal as if it were the only thing that could make me feel better. And in some ways . . . it did. It is strange to see how the roles in life have reversed. Instead of you getting phone calls about me, I am getting phone calls about you. And rather than you speaking with me about kind behavior, better eating habits, or the stating the obvious warnings like, “You need to quit smoking,” and, “Don’t forget to take your medication,” it is me who says these things to you. It is hard to see you in pain. It is hard to keep up with the doctors and their advice. It is hard when we argue about treatment plans and it is frightening whenever I receive calls from an unknown telephone number in Florida. In truth . . . You are the tuffy. In case I never said so, I’m sorry about the time I ruined your date. I still think you could have done better than Mr. School Teacher. But I sure wish I let you make that decision.